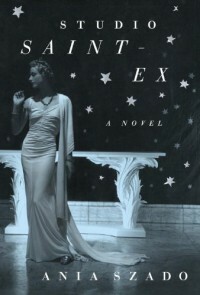 I’m terrified to review Ania Szado’s Studio Saint-Ex because I feel my review can’t do justice to the beautiful story Szado wrote. I planned on reading Antoine de Saint-Exupéry’s The Little Prince before Studio so I could get into the mindset and get reacquainted with the beloved children’s book; however, I read the first two few chapters and put it aside, deciding to delve into Studio Saint-Ex with only my memory of The Little Prince. Szado’s Studio Saint-Ex is a fictionalized biography of Antoine de Saint-Exupéry’s time in New York. It’s 1943 and Antoine is anxious to join the war effort. While he awaits the news of America’s involvement in the Second World War, he is reacquainted with his old English tutor, Mignonne Lachapelle. Mignonne is back in New York, but to reclaim her rightful place among the fashion elite. Her design sketches were stolen by a former instructor and she realizes her instructor lied to her when she said Mignonne had no talent. Mignonne’s brother encourages her to confront her former instructor and along the way she meets Antoine’s wife, Consuelo. Mignonne is puzzled by Antoine’s relationship with his wife and although he proclaims Mignonne to be his muse, one is left wondering who in fact inspires the rose in The Little Prince. The narrative is first person point-of-view and it’s told interchangeably between Mignonne and Consuelo; primarily set in the past, sections intertwine with the present. Szado doesn’t note when the narrative changes, but it’s pretty apparent and doesn’t distract the reader. At the beginning, I found myself drawn to Mignonne’s narrative, but soon I longed for Consuelo’s perspective. I’d like to say Szado devotes equal time to both women regarding their narration, but she focuses heavily on Mignonne and in many ways it makes sense. This is Mignonne’s tale on how one of the world’s most well known authors captured her heart and Consuelo’s role as his wife. Characterization is well done. You can feel Antoine’s frustration at having to wait and see if he’s going to be involved in the war effort. When he talks about how his body has betrayed him due to the crash in the Sahara, your heart aches. Szado does a phenomenal job portraying those feelings and I did feel as if I personally knew Antoine. Szado makes it difficult for us to choose which of the two women we are cheering for. In many ways, I was frustrated for Consuelo and despite the fact that in real life, both her and Antoine had multiple lovers, you can’t help but want Consuelo to have her happily ever after. Consuelo does come off at times as jealous and vindictive and it’s clear she likes to be at the center of attention. The Consuelo we get in the present narrative is different from the Consuelo we meet in the past. I like to think it’s because she no longer has to fight for Antoine’s attention. As for Mignonne, she’s a highly driven young woman, but very naive. I like that Szado gave us that Mignonne because it brings out the innocence of the time periodI can only imagine the level of research Szado had to conduct. She does a wonderful job transporting the reader to 1943 New York City. I loved how she weaves the fashion industry into her narrative. You don’t have to be a fashion expert to enjoy Studio Saint-Ex. While fashion is at the center of the novel, it has an important function. The first ever fashion event that would eventually become New York Fashion Week, took place in 1943 and it was a great way to showcase American designers. For years, magazines such as Vogue featured French designers, but with the Second World War preventing the fashion industry to travel to Paris, what better way to bring fashion and Paris to New York City. The world of fashion comes alive in Studio Saint-Ex along with the fierce competition and you quickly realize what Mignonne is up against.I have several favorite scenes, but I just adore the cape scene where Antoine shows Mignonne his Prince’s outfit. I enjoyed Mignonne being inspired enough to create several outfits for him. The late night studio conversations between Antoine and Mignonne were lovely. The one scene that stands out is the production of The Little Prince. I won’t say anything else because I don’t want to spoil the book, but that was one of my favorite scenes throughout the book.Ania Szado’s Studio Saint-Ex is beautifully written and evocative. By the end, I was in tears and suffered a major book hangover because I wanted to stay in the Studio Saint-Ex world and never emerge. If you’re a fan of Antoine de Saint-Exupéry or historical fiction, I highly recommend Ania Szado’s Studio Saint-Ex.Review originally posted at Literary, etc.